It’s not incredibly unusual these days for cell phone manufacturers to make different lines of devices for different operating systems. HTC is one of these companies, producing both Windows and Android phones. Of course, Android is by far the more popular operating system, but that doesn’t mean that the Windows system doesn’t have its fans too. However, it does seem that HTC just doesn’t try so hard with their Windows devices. There are three main things we look at in a phone: the speed, the screen and the camera. And the One XL won out in all these categories. It’s far more powerful than the 8S, running a 1500 MHz processor rather than the 1000 MHz processor on the 8S, making it faster and more responsive. It also has double the RAM of the 8S (1MB versus 0.5MB), which helps with responsiveness and also makes the device better at multi-tasking. This is important because as an Android phone the One XL is capable of running multiple applications simultaneously, letting you read the internet news whilst chatting on Skype, for example. The Windows phone can’t do this. The screen is thirty per cent larger, coming in at 4.7 inches, as opposed to the four inches on the 8S. Plus it has two and a half times better resolution, and thirty per cent more PPI (pixels per inch). This adds up to make the display brighter and sharper than that of the 8S. The camera is an 8 MP model, rather than the 5 MP cam on the 8S, meaning you get better picture quality with more detail. It also shoots video in full HD. Finally, the One XL comes with double the internal storage, a massive 32 GB of memory, rather than the 16 GB on the 8S. So you can store double the amount of music, pictures and video on the device. Compared to the One XL, the 8S just can’t do anything right. Sure, it comes in around ten per cent smaller and about twenty grams lighter, but that’s to be expected given the difference in screen sizes. But that’s really it. Nothing else. Just because a company makes great phones in one line doesn’t mean that all its lines are good, and HTC is an excellent example of that. 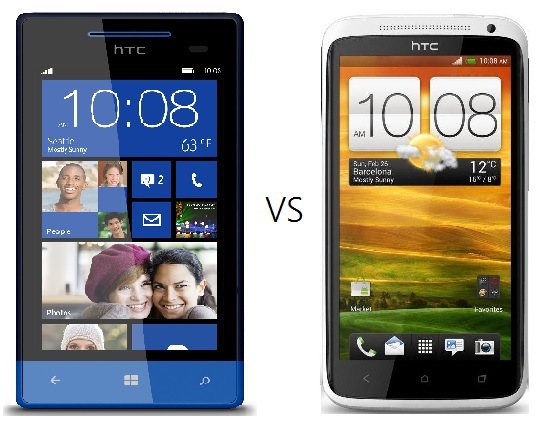 The Windows 8S phone just can’t be compared to the One XL. If you’re looking to buy a phone from HTC, we suggest you go with one of their Android models, they’re simply better. And the HTC One XL is a pretty good buy. Phil Turner has been asked to look at Talk Mobile and their contract deals. He thinks they are looking good.